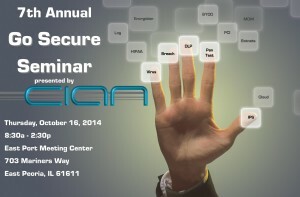 This year’s seminar will focus on the latest technological security advances including the latest network monitoring techniques to detect and defend against Advanced Persistent Threat (APTs) and the IT requirements set forth by HIPAA, PCI-DSS, and other regulations. Our experts will also discuss the security of the cloud and some of the latest news in security. Attending the Go Secure Seminar may earn you CPE credits for CISSP, C|EH, and other security certifications. Go Secure 2013 was a Success! Many IT professionals from across Central Illinois gathered at the Gateway Building on the Peoria, IL Riverfront to enjoy this year’s Go Secure Security Seminar sponsored by CIAN. Attendees had the opportunity to learn about Windows Internal Security, security audits, and the latest trends in the IT community which was followed by an engaging Q&A. We look forward to seeing the same and many new faces at Go Secure 2014! Please follow this link to read about Go Secure 2013 and cyber threats today from the Peoria Journal Star. 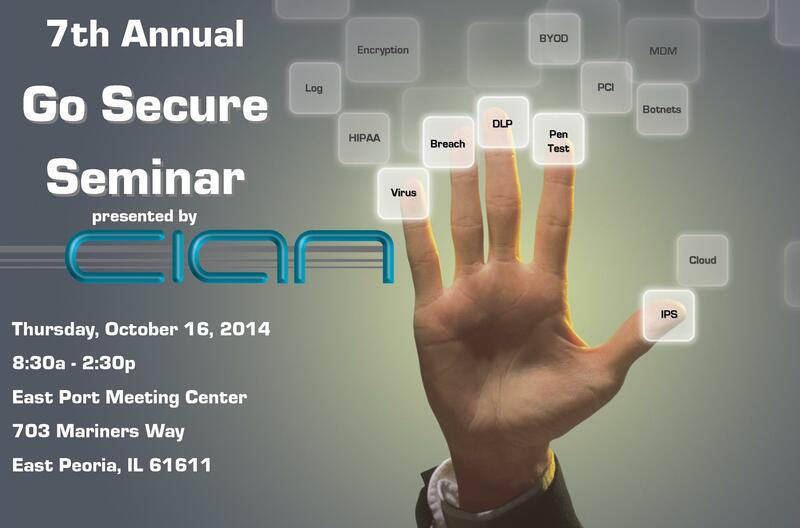 6th Annual GoSecure Seminar set for October 16, 2013! 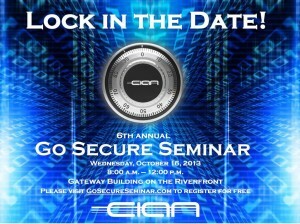 CIAN, Inc. is hosting the 6th annual Go Secure Seminar at the Gateway Building on the Peoria, Illinois Riverfront on October 16, 2013 from 8:00 a.m. – 12:00 p.m. This year’s seminar will focus on the latest technological security advances and the legal requirements for HIPAA, PCI-DSS, FISMA, DIACAP, and FedRamp. Attending the Go Secure Seminar may earn you CPE credits for CISSP, C|EH, and other certifications. Please visit www.GoSecureSeminar.com for more information and free registration.